After brewing outside the capacity of our current mash tun, Nick and I have been looking for a way to build out. After surfing around for a 100+qt cooler, I was looking Craig's List and saw a five gallon water jug for $10. I couldn't resist. I picked up this hoss with the intention of having it be the reservoir for our sparge, but last weekend, Nick mentioned that with a little work, we could make this guy duel porpoise - mash tun and sparge reserve. First off, we had to remove the water spout that was on it already. For this model (and most others to my knowledge) it's just a matter of unscrewing the plastic nut on the back and it's off. Easy stuff. 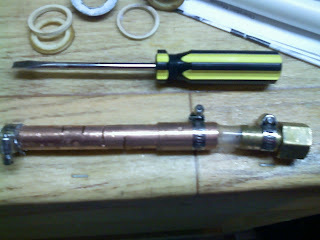 After getting that off, I had widen the hole a little bit to fit the 3/4" ball valve (with threads)through. Don't go too big though, as you want to have as tight a fit as possible. With two gaskets and some silicone, I was able to seal things up (this is a process, but it's worth continuing to do until you get it right). I have a gasket on the outside and one on the inside. 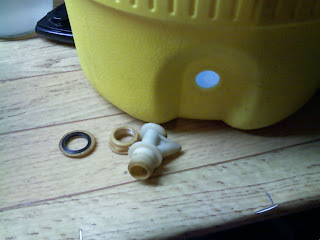 On the inside is a plastic nut from my bottling bucket - works great! This false bottom was Nick's idea. It's a 1/2" piece of copper tube that has slits sawed into it with a small piece of stainless steal (feed grade from a cheap strainer) on the end. 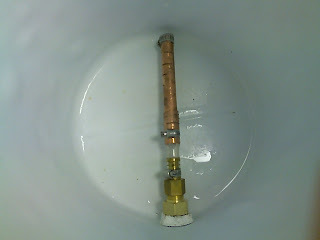 The copper tube is connected to a 1/2" spur via a piece of rubber tube (it was a lot of work to get it over that). 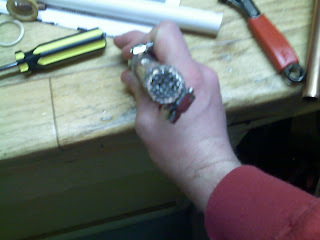 All parts are held in place by screw clamps. 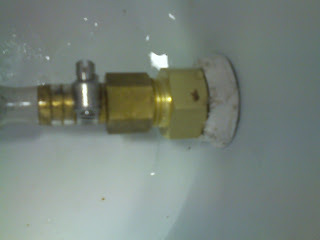 This false bottom (1/2" spur and nut) connects to the ball valve (3/4") through a brass 3/4" to 1/2" connection. So in the end, we have a false bottom for a mash tun using odds and ends pieces I have lying all over. 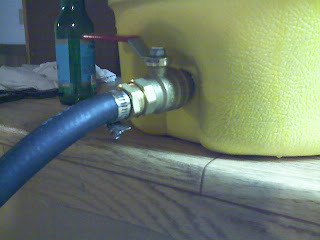 Having a keg system helps me to have a lot of odds and end parts so we were able to make something pretty basic for about $15. To everyone out there worried about the expenses involved in going all-grain (Adam I am looking in your direction! ), here is a way that is cheap - so much so that it will pay for itself in the first batch you do. I'm really eager to move on to all grain brews, but I haven't kicked off the partial grain extract kit training wheels just yet. 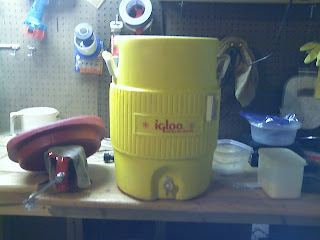 I've been wanting to buy an old igloo jug like that and try building my own tun as well. I just need to find one on the cheap like you did. Great score!